A couple of weeks ago I went to Europe. The main goal was to meet up with my friends Lucie and Alex in Malmo, Sweden for EUROVISION! If you don’t know what this is..think of a super campy American Idol where each country sends one participant. Back in the day ABBA and Celine Dion have competed in Eurovision. I’m half Armenian so I had to support my boys, The Dorians. 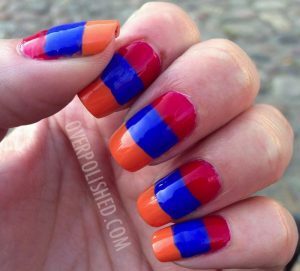 Here are my Armenian Flag nails. I did these in my hotel room with limited supplies, so they aren’t quite as good as my normal manis but I still love them. Here is me and my nails cheering on The Dorians at the Eurovision finals. So glad they actually got to the finals. I thought they were pretty good but not the right kind of music to win Eurovision. 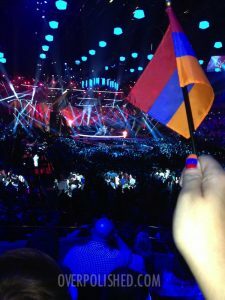 pretty sure I was the only Armenia fan in all of Malmo. My gifts are kinda sad looking. I had catastrophic nail failure this week that not even Orly Nail Rescue could fix! This totally didn’t end up looking like what I thought it would in my head. But the polishes are pretty, right?? 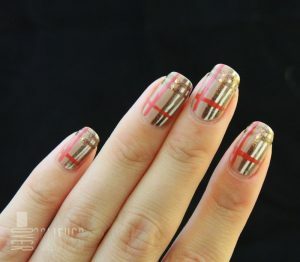 I wanted to do a plaid mani and I was inspired by a lot of great Burberry plaid nail art. This is my fall twist on the classic colors. The base color is Essie Brooch the Subject. I used and Art Club striper for the white and OPI Warm & Fozzie and China Glaze Life Preserver and a striping brush for the colored stripes. f you have a dotting tool and a lot of time on your hands you might want to give this Ruffle mani a try. I’ve seen similar things before, but I loved Chalkboard Nails version so I was inspired to actually do it. 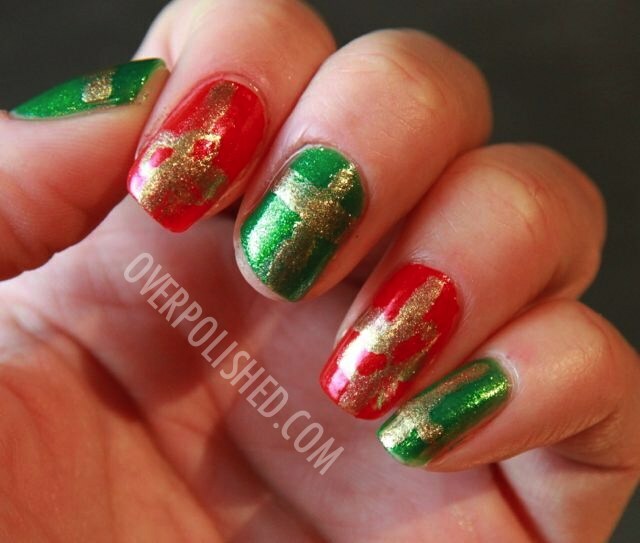 It’s an easy, but time consuming manicure. The nature of the design is very forgiving to mistakes and even my right hand turned out well. You definitely want to choose a large dotter. I went with my second largest, and I regret not using the big one. About halfway through doing this I was wishing my nails were shorter! You should also be aware of the colors you are using. My mystery Essie pink is a bit sheer and didn’t turn out so well when I used it over Sew Psyched. Are These the Best Nail Care Tips Ever?